So here’s the deal with me and dresses: I HATE dress shopping. I will gladly pick swimsuit shopping over dress shopping AN-Y-DAY. Seriously. And you know what? Wedding dress shopping wasn’t any better than regular dress shopping. I know it is supposed to be this magical experience (sidenote: when my mom went dress shopping with her older sister many years ago the shop lady actually walked in front of her spritzing perfume to ‘complete the experience’… my mom the tomboy, almost couldn’t handle it), but I was not one who wanted to go on this never ending quest for the “PERFECT DRESS”. Fortunately my mother and I are fairly decisive people, so we knew if a dress would work pretty immediately. When we found THE dress, it was actually one I didn’t even pick out. My BFF and I were doing a little shopping on our own for the dress before my mom could come in town and shop with us. And as the last of our dresses to try on, the attendant said… okay give this one a chance… it doesn’t look like much on the hanger, but it is BEAUTIFUL on. I took one look at this ‘sample size’ dress (about 3 dress sizes too small), to say I was skeptical was an understatement. But man, I put that dress on and I felt GORGEOUS. I knew it was the dress all the others had to measure up to. I didn’t buy it that day, but waited until Mom was with me to make sure it was something she liked too. 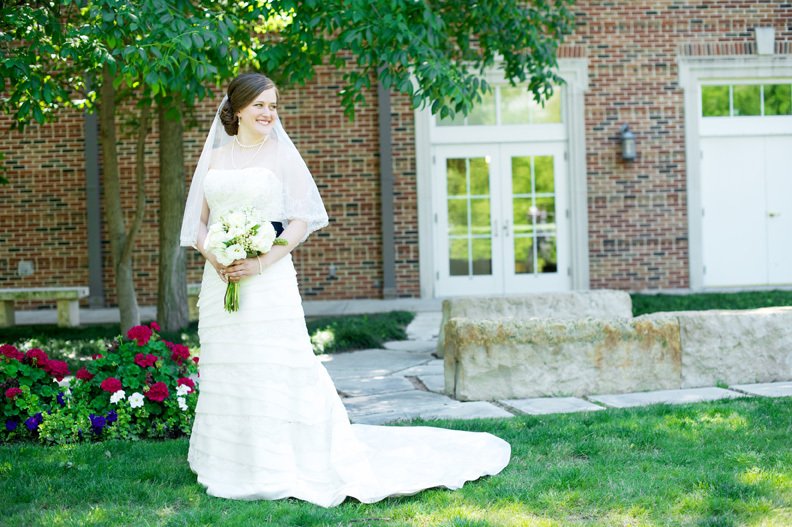 It was the perfect amount of formal and informal (our church sanctuary was SUPER formal, but our reception was awesomely casual) to match our wedding and reception. Mom and I also went hunting for the perfect pair of wedding shoes… they had to be cute and comfy and we went to our favorite shoe hunting place… Nordstrom Shoes. I mean really, it is the holy grail of shoe shopping. 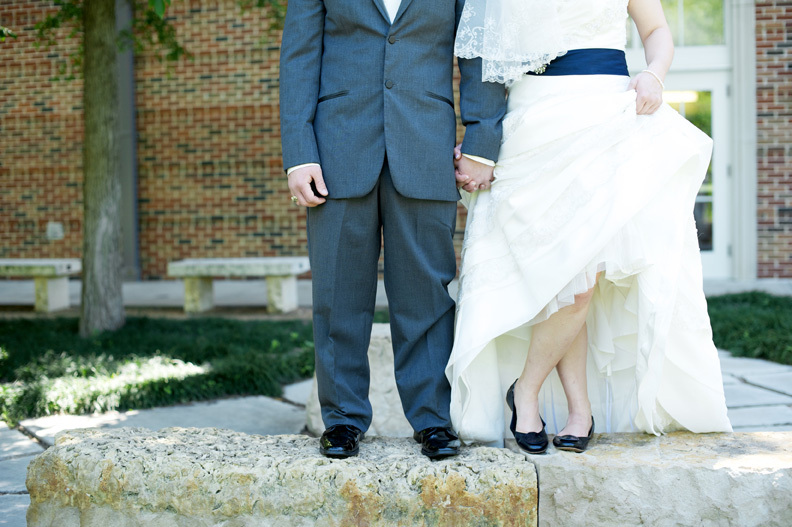 My groom is only about 1” taller than my 5’3” self… although he swears he’s 5’5”. And we all knew my hair would be poofed up a bit, so I decided to go with flats. We hunted through all of the sparkly silver ‘wedding-y’ shoes, but they didn’t really fit my personality. So finally we found the perfect pair of Navy Tumbled Leather shoes. PERFECTION. We tried on several belt sashes on with it, and definitely liked the look with a belt. But did you know that several of those were $250+ for a belt with beading?? So I decided it wasn’t worth it. Mom thought we could take some baubles my grandmother had and make a belt ourselves. We decided to go with a Navy belt to coordinate with the shoes and the bridesmaids dresses. 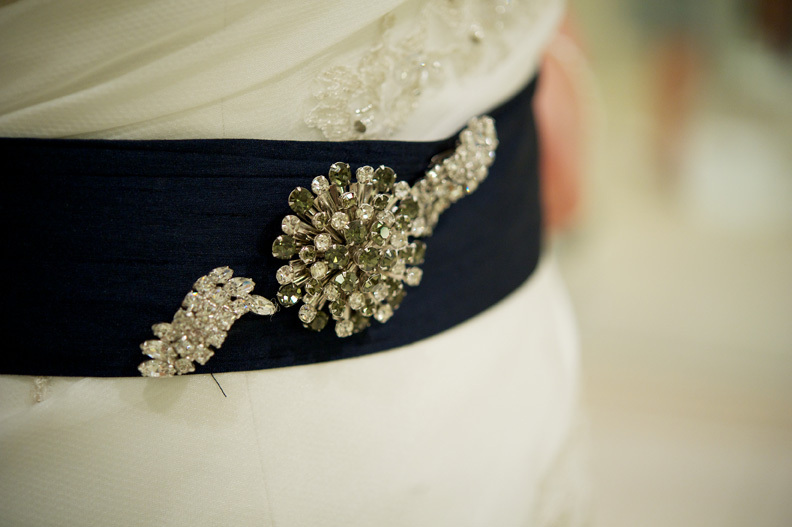 A navy belt is a little non-traditional, but it looked GREAT that day. 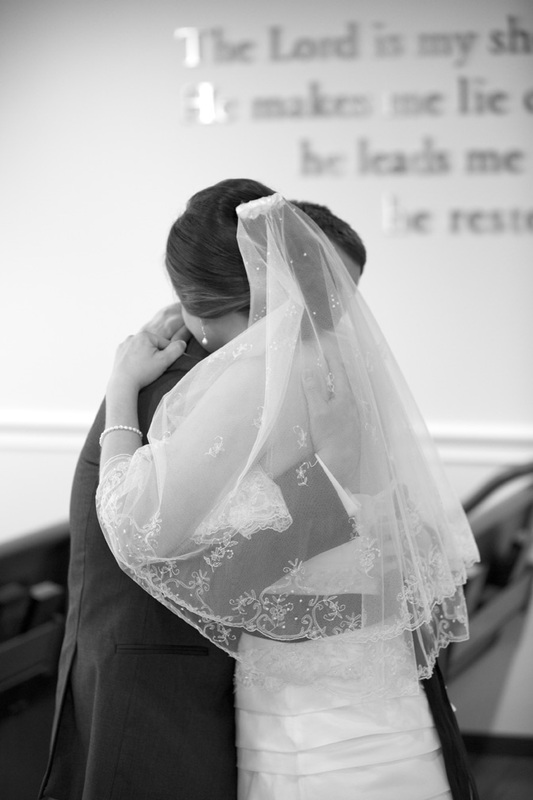 My veil is a family heirloom which my grandmother purchased in Belgium when my aunts were teenagers. 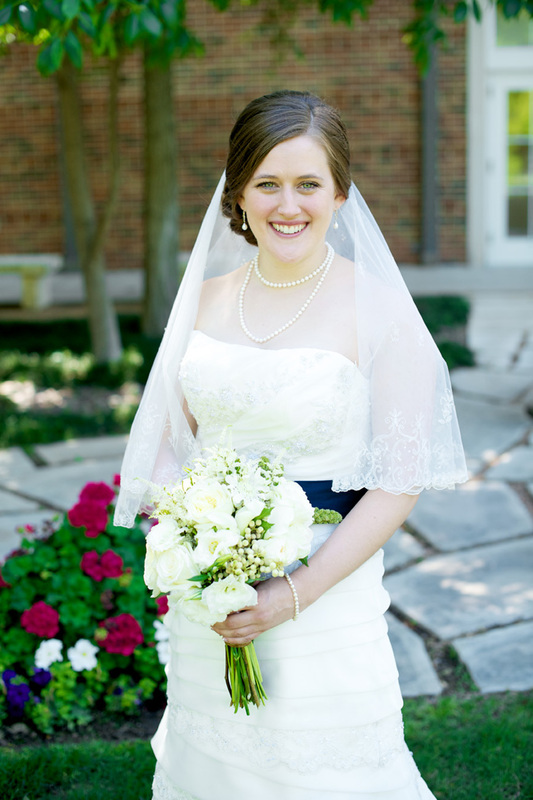 It is a round piece of lace which didn’t have any way of securing to my hair, so in the week leading up to the wedding we bought some cheap clips from a craft store that we could secure it to. I knew I would have a low side bun for my hairstyle, and wanted it to slide in just above that. My mother went to my Great Grandmother’s sewing chest which my grandmother gave to me and stays in my office under the window. I have yet to clean it out (and now maybe I never will). Mom found some old thread that my great grandmother had hand crocheted to attach the veil to the hairclip. So all wrapped up and adorning my head on my special day I had pieces of women who have helped make me who I am. I’m big on tradition and family, so that little extra bit of family helped me feel a little bit of extra love. Something Blue: My sash and my shoes! All photos are taken by Lauren Guy Photography.